Usually recipes I find on Pinterest are a win, or at least pretty decent. Every once in a while, though, I find a dud. This was one of those. 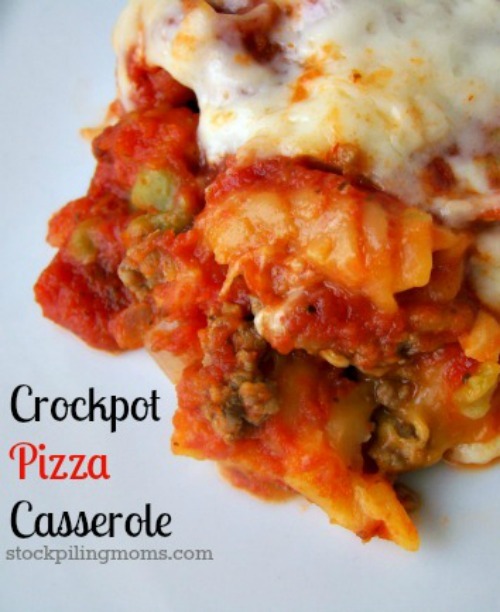 I was really excited about this recipe, because it sounds delicious, and crockpot meals are so handy. Plus, it's got all the flavors of pizza, so that should be amazing, right? I don't know what it was, but this was terrible. It was so bad that my husband, who is not a picky eater and is usually gentlemanly enough to choke down even bad cooking, couldn't finish his serving. I tried a few bites and told him not to worry about hurting my feelings, and to stop trying to eat it. It tasted like chewy cardboard, or something equally unappetizing. The texture of the pasta was terrible, and I don't know how or why, but there was zero flavor to this dish, in spite of the promising list of ingredients. You put what should be amazingness into the crockpot and watered-down-tomato flavored chewy cardboard comes out. Gross. We ended up having to order a pizza and throw the rest of the casserole out. Talk about a frustrating waste of time and money! I know when someone says a recipe is just terrible I always wonder if maybe they made a mistake in making it. I mean, it happens, right? Although this would be a pretty difficult recipe to mess up, and I am a more-experienced-than-average cook, I want to assure you it wasn't just me who thought this was bad. Several of the comments on the recipe said it was gross, and an acquaintance of mine made it and also had to throw it out and order takeout. Final rating: 1 out of 5 stars, and that's being generous. Save your time and money, and don't make this recipe. If you're looking for a pizza casserole that actually tastes good, check out my recipe for Cavatini! ooooh! This looks SO good! Ps: I don't think I ever noticed your background, and I love it! Wow! Thanks for the honest appraisal, very helpful! Yes...that was a truly hideous meal...bleh. Yes, it was just awful! There's not much we find inedible around here, but this certainly was!